[ARCHIVED THREAD] - Got My KAC SR-15 Mod 2 .... pics! 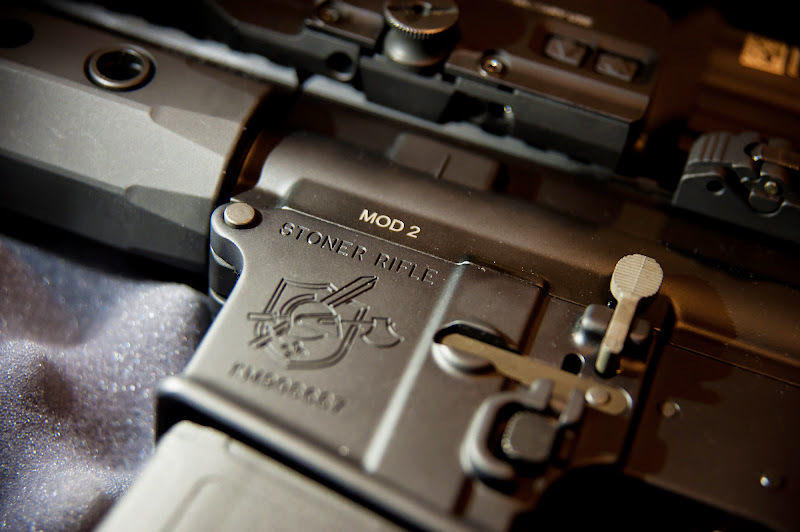 Here's my new Knights Armament SR-15 E3 Carbine "mod 2". Picked it up yesterday but haven't made it to the range yet. I put an EoTech 517 and a G33 3X magnifier on. Works great with KAC's flip-up sights. Here are some pics! Is this your first KAC? 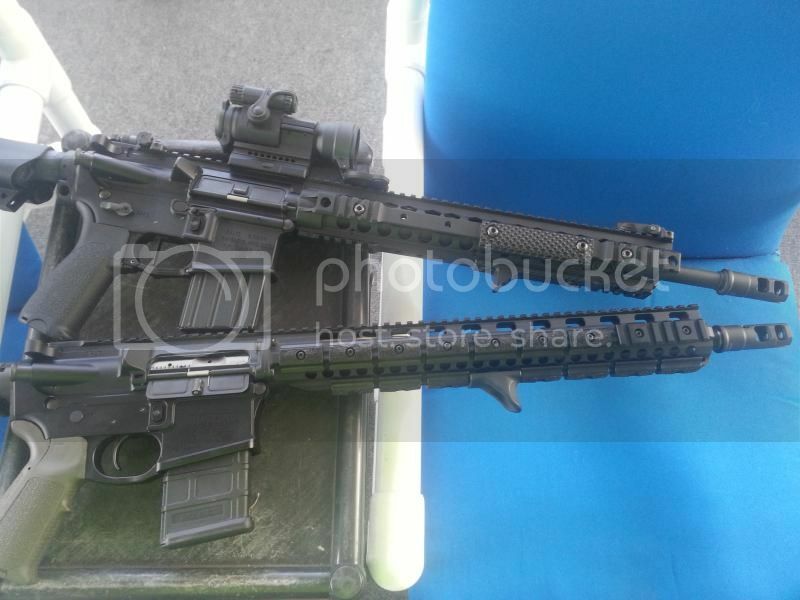 Been really tempted to pick up a 11.5" SBR from them... but no Mod 2 yet for that. What's your thoughts on it so far? Thanks. Yes, my first KAC. Only my 3rd AR. First was a RRA Predator Pursuit. 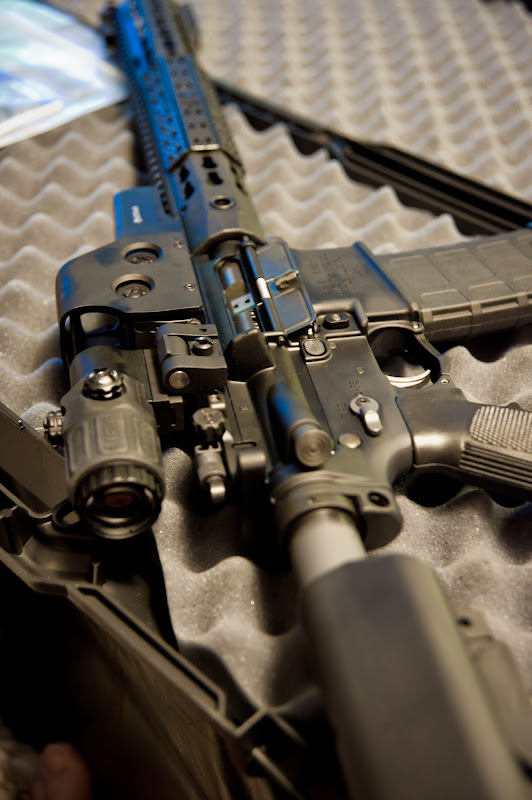 Second was an M&P-15 Sport which I still have and its a wonderful shooter. First impressions of the KAC? Well awe shucks, what can I say, I'm in love! That's honestly why I bought it. Just happened to ask to to hold it one day at LGS. When they handed it to me I didn't want to put it down. I went home and began to research the brand and the gun itself, talked on the forum a little, and pretty much turned into a KAC nut overnight. Haven't shot it yet mind you, but I'm very confident that it more than live up to its price and reputation! 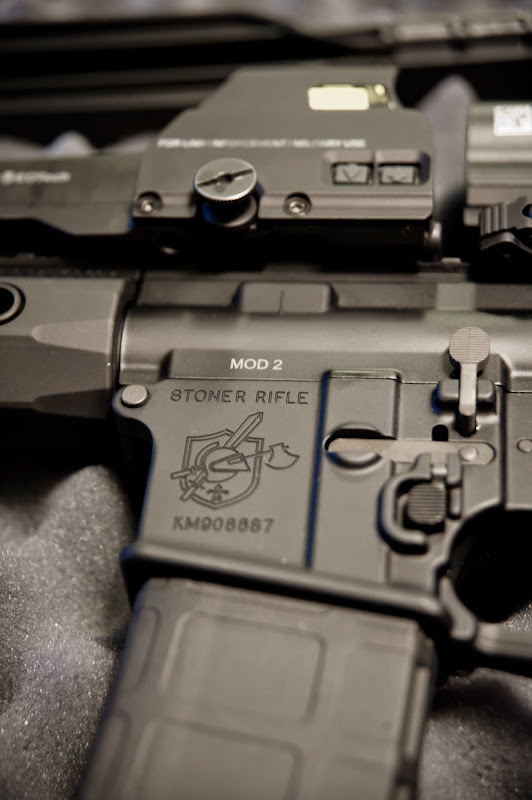 The keymod rail system is interesting. I'm not sure how I feel about it. Definitely light weight and ultra limitless mods you can do to it. I had one hell of a time attaching those grip panels. There are seven sides to that rail so seven pieces of grip panel. By the seventh one I had the motion down but my thumbs were rubbed raw! Also the little extra rail piece it came with you can attach anywhere you want BUT they don't inclue a 3/32 Allen wrench that is needed to attach itl. 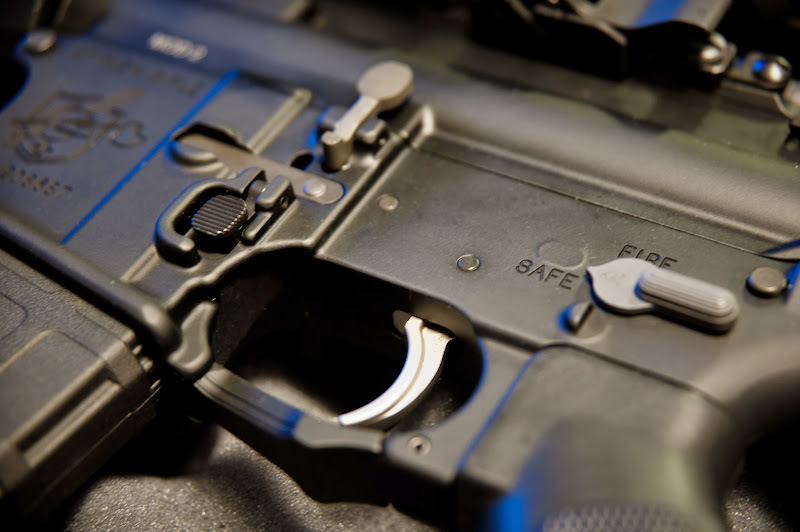 Another very minute annoyance is that for such a fine AR, the included mag was the ugliest gray USGI scratched up POS. Kinda funny actually. Incidentally when I looked at the mod 2 the first time they also had the 11.5 inch version you spoke of. I understand they can be hard to find but there's at least one place I kmow has it! Congrats OP. I think you got one of the finest factory built AR's money can buy. Congrats on your new Mod 2! Congrats on the new boom stick! I remember your thread asking about it versus a DD rifle, glad you made the right choice haha. Change out that A2 grip and it'll be perfect. The grip panels for the URX4 are a pita but that are the best for the keymod rails at the moment. The magazine that comes with the KAC rifles is an excellent USGI metal mag and the white KAC followers are basically Magpul followers. I'd be glad to take it off of your hands if you don't want it. Shoot me a PM if that's the case and I can arrange payment. Again, congrats on the Mod 2 and welcome to the KAC Nut Family!!! Originally Posted By TejasSD:The magazine that comes with the KAC rifles is an excellent USGI metal mag and the white KAC followers are basically Magpul followers. I'd be glad to take it off of your hands if you don't want it. Shoot me a PM if that's the case and I can arrange payment. Thanks! I think I'll hang on to it. After all you can never have too many mags laying around. As uh Borat says !! Congratulations on one of the finest AR's made. Congratulations on getting what IMO is the best overall AR rifle! Nice looking rifle! I actually considered the Mod 1. Boltcarrier.com has several left an they're under $1900 shipped! I was really tempted to go that route but ultimately I decided to spend the extra few hundred to get the Mod 2. SR15 either in Mod1 or Mod2 are great rifles, however, the KM is simply not for me b/c of stupid personal reason. It saddens me to think back that I decided to not get it. Oh no. Don't tell me these KAC's can become an obsession like 1911's! I will end up in the poor house....but with a damn fine gun collection! Hey... So I'm taking the new KAC out Sunday morning to run some rounds thru it. Can anyone tell me if I should follow a particular "break-in" procedure? From what I can tell the manul says nothing about it. For the barrel there is no break in, unless you really want to follow the whole, shoot a round then run a patch through it, and repeat 5 times but wont do anything for you since its chrome lined. I load 1 round from the mag and shoot to see if bolt locks back. Then go from there. I don't get the barrel smoking hot the first couple of times out, but that's just me, some say shoot the hell out of it, but I like to make sure everything is functioning just fine until I start rapid fire. Have a great day shooting. 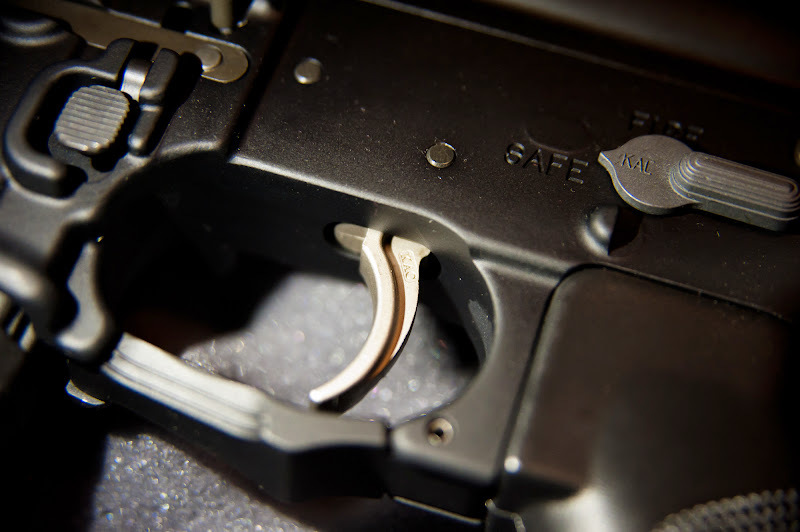 I personally don't believe in 'break-in period' for any military pattern firearms, especially a rifle from a respectable manufacturer like KAC. Just go ahead and shoot the rifle, don't think too much about it. For barrel break in, run a dry patch through it to make sure there is no foreign matter from manufacturing that could foul the barrel when a bullet gets squeezed through it. I always like to get a good baseline on accuracy when a barrel is new, and 're-check every 2000 rounds or so to track degradation. amazing weapon. Excellent technology and light. Great gun OP. However, i dont understand that heavy eotech setup. I wouldnt want that on there if it were mine. 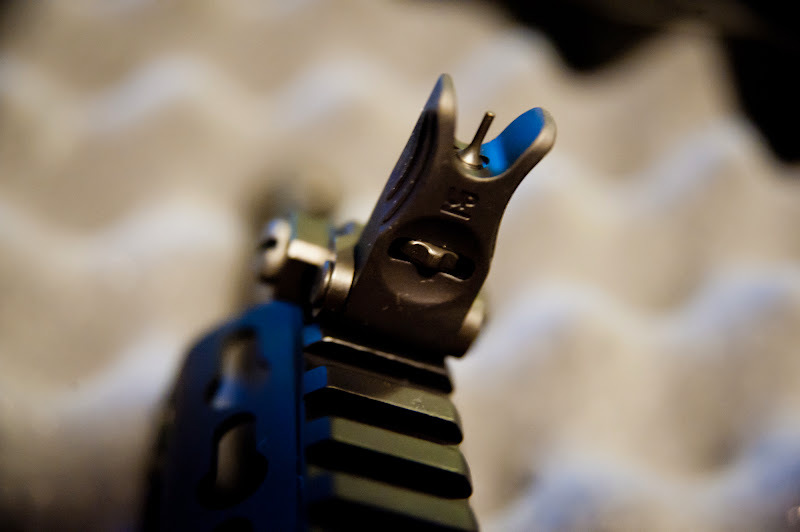 Id do an aimpoint micro or mini acog or just the irons before id toss that eotech on. Ive used that setup and i thouht it was heavy and not really that effective. Just my $0.02. Congrats on new toy though, its really nice. I'm putting on a heavy optic (Elcan Specter DR) -- figure since the rifle is such a light weapon to begin with, it offsets the weight of the optic well. I'm considering other optic choices. I'd love any suggestions. I already had the eotech (on my M&P) and while I LOVE it I've been planning to add the 3x magnifier to help my poor eyesight. When picking up the KAC I could not think of a different optic choice to throw on there that would enable me to do all that I want so I picked up the 3x at the same time and decided to put it and the eotech on the KAC. The eotech/magnifier combo let's me use the holographic sight alone for CQB type situations and fast target acquisition, while still enabling me to flip up the irons and either co-witness, or use them as backups. And then, since my eyes are kinda weak and I like to shoot distances greater than 50yds occasionally, I can flip the magnifier over and easily do that! Incidentally the eotech reticle is SO MUCH BETTER thru that magnifier. 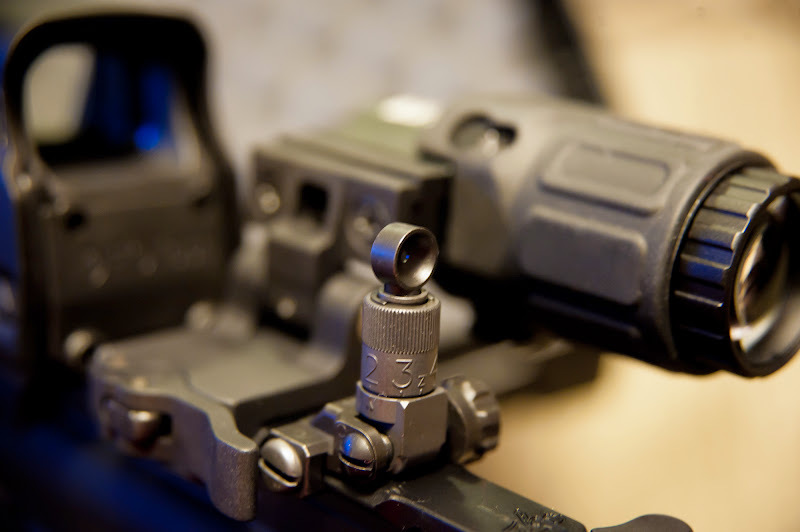 Another reason I chose eotech over aimpoint is for the 1 MOA dot. The weight isn't really that big of a deal to me. 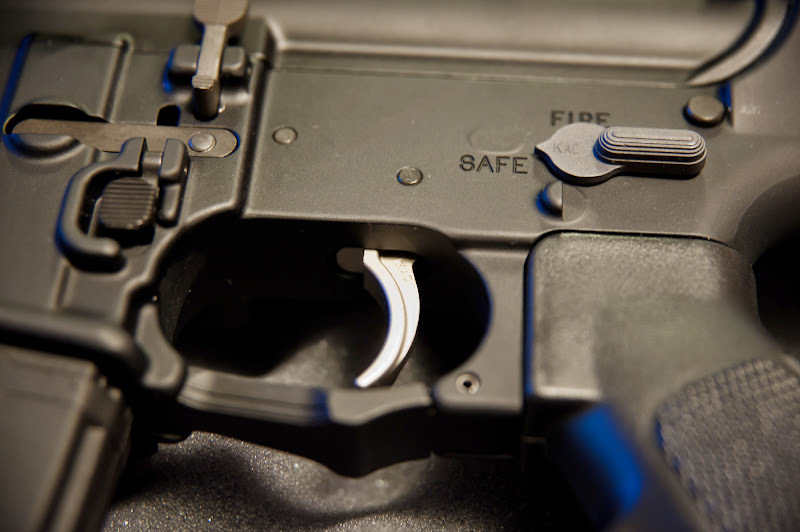 Ultimately I want an optic that won't get in the way of the flip up sights so I can use them as backups and/or co-witness AND has some magnification as well. I think the eotech/magnifier combo is kinda the best choice. Sounds like the EOTech is right for you then. Who cares what anyone uses? I have a XPS on a LT110 on my Mod1. No magnifier though. Works great. Weight is in the center so its not noticed too bad. Some people pray for the end of civilization because they think they will finally have a chance to be a badass. Others who already are badasses, fight to preserve the civilization we currently have.